IU debuted in 2008 with her first album 'Lost and found'. She was only 15 years old at that time. And 6 years later, she now became one of the most popular Kpop stars. She's cute and sweet, but there is another reason for her immense popularity. Well, she stands out from many young female Kpop stars by thinking and behaving differently. 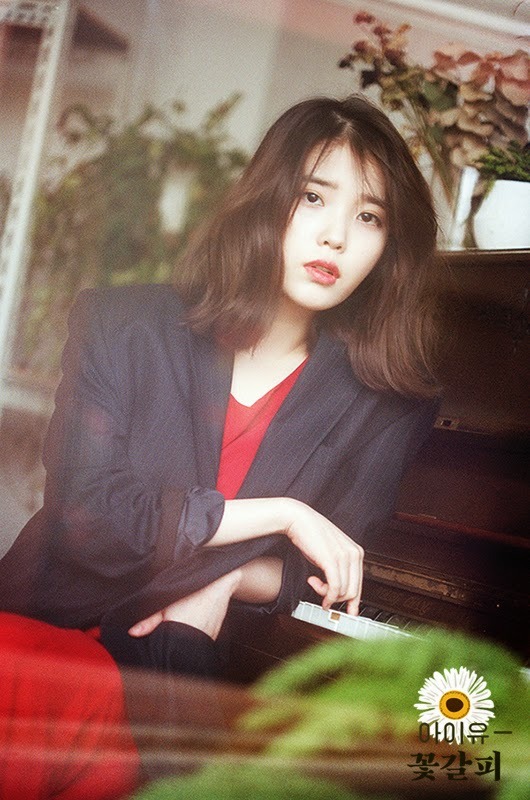 IU will release her new album on May 16. By the way, the album's concept is unusual. It will be her first ever remake album and she will reinterpret the past hit songs with her own characterful vocal tone. The title of the album is 'Flower mark'. It is unusual for a young Kpop singer to release such kind of album because releasing her own new songs probably benefits the singer more, and it is really hard for a young singer to reinterpret the past hit songs with her own musical sensibilities. But, IU made a bold decision. Years ago, IU looked just like other female singers of her age. She was just pretty and adorable as you can see in her former hits such as 'Boo' and 'Marshmallow'. However, as time passed, she began to show something different from other young stars. In the song 'The red shoes', she did a music based on big band's swing sound, while she showed off her outstanding musical talent in 'Friday', singing to the accompaniment of a guitar. She also collaborated with her big seniors such as Choi Baek Ho and Yang Hee Eun through her third album 'Modern times' that was released in 2013. In the upcoming new album, she will collaborate with another big senior Kim Chang Wan, who is a lead vocal of Korean legendary band San Woollim. It is very difficult to measure singer's popularity in an objective way. Do you have any idea for measuring it? Well, I think number of audiences who came to the singer's concert can be helpful. In Korea, Gymnastics Stadium at Olympic Park which accommodates more than 10,000 audiences is the biggest indoor concert hall. I'm sure that IU, who is one of the most popular singers in Korea, is fully able to draw more than 10,000 audiences. However, IU decided to hold her upcoming concert 'Just one more step, just that' at the Sogang University's Mary Hall, which is a little theater that can accommodate only 455 audiences. In comparison to big scale concert, losses will be adding up, through this and that. She just wanted to commune with her fans at a close distance. Furthermore, all the proceeds of the concert will be used for the victims of the Sewol ferry tragedy. She's so considerate and mature. Concert tickets were all sold out in just 10 minutes. IU has been active as an actress too. She made her drama debut in 2011 by appearing KBS' 'Dream high'. In the drama, she played a fat and ugly high school girl. By wearing special effect makeup, she tried to pretend to be unattractive. Have you ever seen a Kpop idol star who tries to do such a thing? In a phone interview, I asked her, "Don't you want to look pretty in the drama?" Her answer was as follows. "Yeah, I want to look pretty, but it can't be helped because I have to express my character well. I can bear this degree of hardship." She spoke lightly, and I was sure that she will grow up as a competitive actress. In other dramas such as 'The best Yi Sunshin' and 'Pretty Boy', she never tried to look pretty. She just focused on her character and did her level best. "In dramas, handsome main male character usually falls in love with main female character who is not pretty. I'm confident of being not pretty in drama. Without any makeups or special effects, I can look like humble and pitiful."